Hotel and Restaurant Museum is specialised in the history of hotels, restaurants, cafés, tourism and Finnish culinary culture. 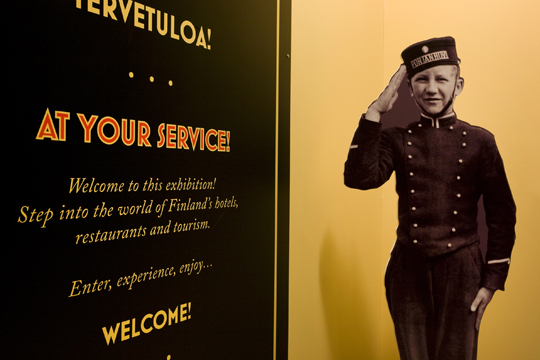 The permanent exhibition covers the history of catering and also the history of alcoholic beverages and sales of alcohol in Finland. Guidance by arrangement. Helsinki Card and Museum Card accepted. Free admission on the last Wednesday of the month from 5 p.m to 8 p.m.
Free admission for visitors under age of 15 years. At this exhibition You can find out about Finnish food and drink culture, make a trip to the history of traveling in Finland and enter the world of restaurant and hotel staff. You will see behind the scenes in hotels, kitchens, restaurants and bars. Peek at a speakeasy and 1930s liquor store, experience a night out at the 1960s, be a star at the karaoke or dance by the rhytms of old favorite songs. It’s also a mealtime. Find out what are the favorites and first appearances on the Finnish dining table at different times. The Scent bar takes You to the world of spices and herbs. Deepen your experience with a guided tour. Guided tours to the exhibition are available in English and Finnish. The tours last approximately 45 minutes. Maximum group size 20 people. Happy Hour – exciting details about the prohibition era in Finland and the establishment of state alcohol monopoly Alko. Your guide will be a waitress from the 1930s. Let’s Feast – learn about the Finnish culinary culture during the last hundred years. With this tour you can also order tasting menu with few small alcohol drinks explaining the Finnish drinking habits. Reservations are recommended to be made at least one week in advance. Information service is for everyone interested in Finnish culinary culture and the history of travel, hotels, restaurants and cafés in Finland. On the spot it is possible to study museum’s archive materials like menus, bottle labels, photos of restaurants and hotels and also literature. You can also contact us by e-mail. Metro: Ruoholahti, about 600 m from the station.